Ivory Tabernacle, the Annunciation, late 14th century (Louvre). Photograph by Marie-Lan Nguyen, 2006. It was entirely owing to the Cluniac movement that such artistic refinement was possible, 500 years after 12 monks started the monastery at Cluny. Until Cluny, virtually no Christian art had featured the Virgin Mary as an object of special adoration. The purpose of this article is to demonstrate the tremendous role that the arts play in helping to propagate a spiritual movement, using the example of the Cluniac movement at the end of the Dark Ages. It is my hope that the story of Cluny will inspire artists who hold spiritual ideals today. Because the article will induce eyestrain when read on a computer screen (it’s over 13,000 words), I have provided PDF and Word versions for those who wish to print it or save it on their Kindles. I also offer a brief summary for those who prefer not to wade through the details. A reasonable approach might be to read the article offline and visit the pretty pictures here, or browse the sections, pictures, and boldfaced passages and dive in as you feel inspired. For those who choose to persevere, I’ll try to make the journey as pleasant as possible. Click link to jump to a section. I compiled this presentation in response to Swami Kriyananda’s assertion that Ananda is the most important thing happening in the world today. 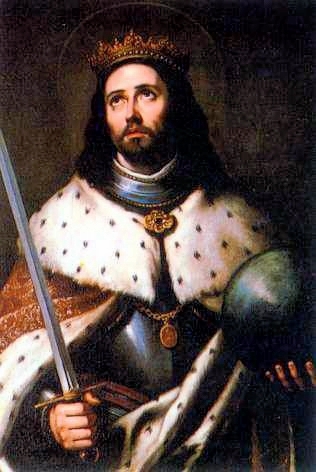 Fernando III of Spain (1221-1284), known as “El Santo” (The Saint) was Paramhansa Yogananda in that former life. Paramhansa Yogananda was an avatar, sent by God to help modern believers meet the twin challenges of science with its atheistic bias, and fundamentalism with its unscientific demand for blind belief. Yogananda revealed how people of all faiths can make their religion scientific, by conducting experiments in the laboratory of their bodies and minds, using appropriate scientific tools of meditation and prayer. Although he predicted that his teachings would change the world, the changes, at this point, have scarcely begun. It took Christ’s teachings 300 years to gain a foothold, and another 700 years before Europe became fully Christianized. We may hope that Yogananda’s work will proceed at a less stately pace; but for those who may doubt the power of a small band of spiritual pioneers to influence the course of a civilization, this account might lift their spirits. 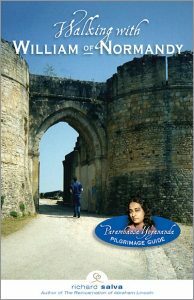 In summary, this document tells how Paramhansa Yogananda and Swami Kriyananda, in their previous lives as William the Great and Henry I of England, and Fernando I and Alfonso X of Spain, helped to spread a similar divine dispensation 1000 years ago. It highlights the role that the arts played in bringing the good news to the masses. This concludes the summary. At the end of the document, I will provide a list of books and other sources that helped me in my research. It is recommended to click the smaller photos of Cluniac art to enlarge them. I learned of the monastery at Cluny while having my hair cut. My former wife and I lived in a one-room cabin at Ananda Village, in the foothills of the Sierra Nevada, and weather permitting, my wife would cut my hair outdoors while I sat on a stump and read aloud to her from Kenneth Clark’s book, Civilisation. 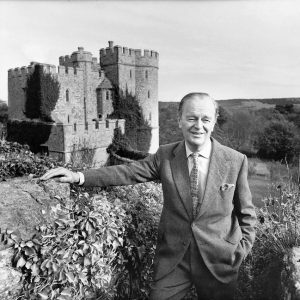 Lord Clark (1903-1983) was the most prominent art historian of his day. He held highly visible positions – fine arts curator of the Ashmolean Museum at Oxford, director of the National Gallery, and Slade Professor of Fine Art at Oxford. In 1969 he presented the widely admired television series, Civilisation: A Personal View, on which the book of the same title is based. I had come to a sense of life’s meaning through the teachings of Paramhansa Yogananda, author of Autobiography of a Yogi, and through a book by his disciple, Swami Kriyananda, Out of the Labyrinth: For Those Who Want to Believe, But Can’t. Civilisation added a brick to the wall of meaning that I had been building, after having it knocked down by a university education. I was grateful to Clark and wrote him a letter to thank him. 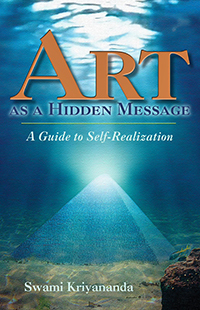 I described our haircutting sessions and enclosed a copy of Swami Kriyananda’s book, Meaning in the Arts (since re-titled The Artist as a Channel, and later Art as a Hidden Message: A Guide to Self-realization). I subsequently learned that 700 American viewers of Civilisation had written to thank Clark for the series. Many expressed their gratitude to him for having renewed their sense of life’s meaning. Seven said that the book had prevented them from committing suicide. Lord Clark had set out, with Civilisation, to help people regain a sense of meaning. He intended the series as a rear-guard action against the sad troubadours of meaninglessness – with an important caveat. While Clark believed that the arts can play a tremendous role in communicating the ideals of a civilization, he pointed out that the actual wellsprings of great civilizations lie in spiritual renewal, and the confidence that it gives people to attempt great things. This series has been filled with great works of genius, in architecture, sculpture and painting, in philosophy, poetry and music, in science and engineering. There they are; you can’t dismiss them. And they are only a fraction of what western man has achieved in the last thousand years, often after setbacks and deviations at least as destructive as those of our own time. Western civilisation has been a series of rebirths. Surely this should give us confidence in ourselves. Clark returns, again and again, to the idea that great art is born at times of spiritual renewal, when people have gained a sense of life’s high purpose. He draws our attention to three periods when the entire world seems to have experienced such a renewal – around 3000 BC, 600 BC, and 1000 AD. Great souls appeared on earth at roughly the times Clark mentions: Buddha around 3000 BC, Plato and his followers circa 500 BC, and a surprising number of spiritual giants who were born in the West around 1000 AD, coinciding with the Cluniac revival. 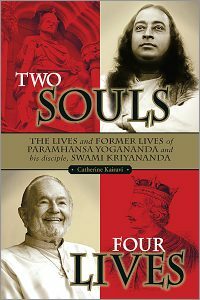 Swami Kriyananda would shortly be traveling in England – could a meeting with Lord Clark be arranged? It was a charming prospect! Swamiji was deeply conversant in the arts and believed that they would play a prominent role in the renewal with which his guru had tasked him to help him complete. A meeting was unfortunately prevented by Lord Clark’s death. In his two-volume autobiography, Another Part of the Wood and The Other Half, Clark describes an experience that he had in an Italian church. He was granted a spiritual ecstasy that lasted for two or three weeks. Unable to reconcile his professional commitments with the assumption that he would have to enter a monastery to pursue the awakening, he simply set it aside. It seems unfortunate that the two men were unable to meet, because if ever there was a teacher who knew how to reconcile a life of spiritual dedication with intense activity, it was Swamiji – witness his prodigious creative output, which included 140-plus books, 400 musical compositions, and thousand of photographs. After a forest fire burned nearly all of Ananda Village in 1976, a number of families left. I remember a meeting after the fire during which Swami Kriyananda praised the Ananda members who had helped their departing brothers and sisters to get on their feet financially so that they could leave. 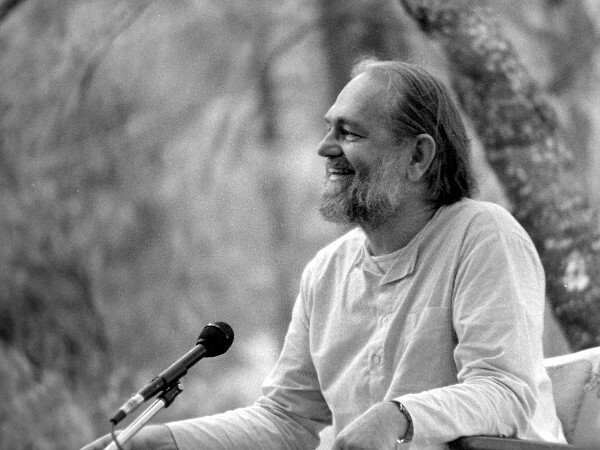 Swami Kriyananda gives a talk during Spiritual Renewal Week at Ananda Village in 1975. For many, Ananda serves as a temporary way station on their journey. Others may see only a pleasant church with sweet songs, entertaining talks, and nice folks. Few grasp the role that Self-realization is destined to play on the world stage. The story of Cluny lends weight to the notion that tiny spiritual movements can have great power, and that art plays a vital role in expanding their spiritual message to all. “If you want to understand me,” Swamiji said, “listen to my music.” He explained that the music conveys the teachings of Self-realization directly to people’s hearts, better than words can. Cities of Light need, as I’ve said repeatedly, to be developed as a new kind of monastic order; otherwise, they will not succeed. Communities that have a spiritual base will naturally be able to touch people on a soul-level. The more they themselves experience of God’s presence in their lives, the better they will be able to share with others something vital and valid. In addition to touching others directly on a soul level, however, they can touch people also, and perhaps reach many more people, through the arts. The arts, therefore, will always be one of the best possible ways for communities to reach out to others. They will also remain an important way for a community to clarify its own directions. Members of the community that have a talent for artistic expression should be encouraged to paint, write, compose music, sing, write plays and act in them, create spiritually inspiring dances, and carve in stone or cast in iron the great, central ideas that have ever uplifted the human race, and that will ever continue to do so. To understand how the arts can help renew a civilization, we can look to a period when the world came close to the abyss, and observe how the arts helped to restore people’s hope and confidence. Comparing Ananda’s fledgling work with those small beginnings, we will find tantalizing parallels. In the discussion that follows, we will look at one of history’s darkest times, and see how the arts helped bring us back from the brink. During the reign of the Emperor Charlemagne (742-814), there was a wonderful increase of literature, writing, the arts, architecture, jurisprudence, liturgical reforms, and scriptural studies. However, the effects of this cultural revival were limited almost entirely to a small group of court literati, and after Charlemagne’s death the minor renaissance quickly faded. Why wasn’t the Carolingian renewal able to touch people in the powerful way that the Renaissance would, 500 years later (1300-1600), or that the Cluniac movement did, after 910 AD? New ideas almost always begin as philosophy. At this stage they may be read and discussed by few – even as, in science, Einstein was first discussed by only a handful of other scientists, and understood by even fewer. Creative artists (composers, writers, and others who express themselves creatively) are usually closer to new waves of thought than the general mass of people. Few artists are philosophers themselves, but they enjoy the stimulation of new ideas, and tend to become the popularizers of those ideas. Thus, through the arts new concepts reach out and actually touch the common man…. If there is one thing, then, that Cities of Light ought to focus on, it is the question of how to express their philosophy through the arts. Probably only after they’ve succeeded in expressing their ideals and their state of consciousness through some aspect of the arts will people generally come to appreciate what they represent. Perhaps Charlemagne’s innovations failed to spread because they were secular and intellectual. Great renewals touch the common people – they are felt as much as they are understood. And because their roots are spiritual, they touch the soul. The only influence greater than the arts in its potential for inspiring people is direct, inner religious experience. This doesn’t mean fanaticism or religious dogmatism, but rather some actual experience of inner, divine blessing. People who have been so blessed find themselves transformed from inside, and not merely superficially, through their emotions and imaginations. Such an inner change is much greater and more enduring than any that is effected from without, through the arts. The 200 years between the death of Charlemagne in 814 and the turn of the year 1000 have justly been known to historians as the Dark Ages. Never has the western world experienced such a complete breakdown of civil and religious order. What little government remained from Charlemagne’s time lay paralyzed through factional power struggles. On the local level, armed barons clashed with each other, employing the violent tactics of gangsters. On public roads and highways, brigands attacked wayfarers, robbing and murdering at will. Virtually the entire continent reeled under armed invasion, political chaos, factional violence, blood-feuds, ever-present danger, and constant fear. From all directions, Vikings, Magyars, and Saracens attacked helpless towns and villages, massacring, pillaging, and enslaving. No population center was safe. In their wake, they left broken families, homeless children, epidemics, and famine. 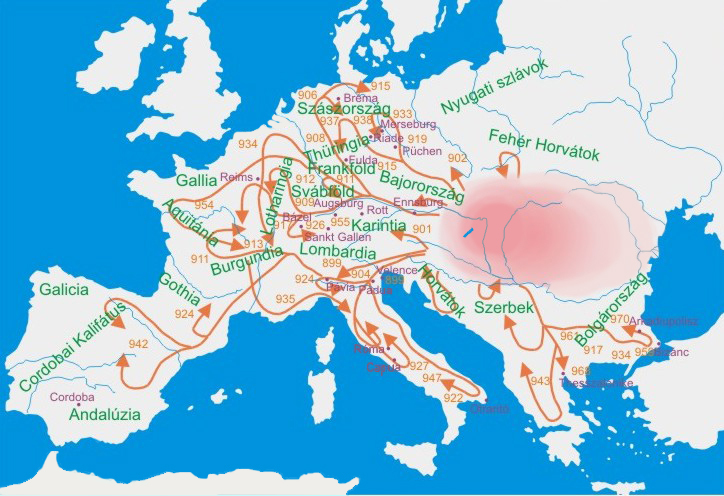 Invasions of the Magyars in the 9th and 10th centuries. Caught in the middle of this lawlessness, the common people tried desperately to go about their lives, always within a state of underlying anxiety and real physical threat. The age was one of despair and helplessness. As always in the midst of civil disaster, Christians looked to the church for hope and salvation. What they found instead was a state of widespread corruption and disorder seldom witnessed in church history. The body of bishops was a mixture of the saintly, the mediocre, and the scandalous. Many had bought their offices and lived like barons in ecclesiastical attire. A great many waged petty wars for personal advantage. Numbers of them lived openly with mistresses, bestowing church properties on their illegitimate children. Monasteries, which for centuries had served as exemplars of Christian kindness and chastity, degenerated into centers of idleness and dissipation. Monks neglected the Mass and sacraments and forsook the spirituality of their communities’ saintly founders. A great many took wives or concubines. Where the lay faithful had once found faith and hope, they now saw religious indifference, spiritual ignorance and sensuality. Viking Expansion. Between the Vikings, the Magyars, and everybody else, the Dark Ages were hardly a favorable time to be born. Lord Clark suggests the terror that a homemaker must have felt upon seeing the prow of a Viking warship rise over the horizon as it made its way up the Seine. In Rome, the papacy stood as a coveted political prize. The leading Roman families vied, like modern mafiosi, for control of the richest benefice in Christendom. During the half century before the year 910, there were 15 popes, an average reign of three years. Four were almost certainly murdered, and several others may have been. Several of these pontiffs were well-intentioned men who tried to enforce the laws of the church and discipline the clergy. But their orders were either lost en route to brigands, or were ignored. Many Christians wondered if the end of the world was at hand. Social and religious decay of this magnitude could not continue much longer. Around the year 910, in Burgundy, about 250 miles southeast of Paris, William I, Duke of Aquitaine (875-918) arrived at a decision that would have incalculable consequences. As a youth, William had committed an impassioned act of murder. Toward the end of his life, his remorse drove him to seek spiritual solace. For more than a year he received spiritual direction from Berno, the abbot of a small monastery in Baume, Switzerland, one of the few religious communities that still retained the rule of St. Benedict in full. When William learned of Berno’s holiness he asked the priest to come and serve as his spiritual director. They became fast friends. William decided to establish a small monastery on his lands. It would be a place where men sincerely devoted to God would pray for his soul and for the needs of the church. He was distressed by the widespread corruption in the monasteries, and determined that his foundation would be different in two respects. 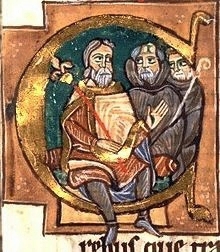 William of Aquitaine with Abbot Berno. First, the abbot and monks would report directly to the Pope; no barons or local ecclesiastics would lay claim on or otherwise interfere with the community’s life. Second, he would see that his foundation was inhabited by men of prayer: monks who took their divine vocation seriously. 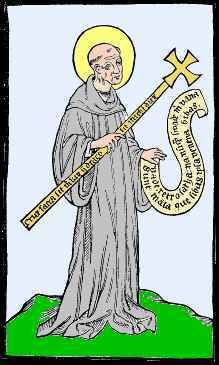 He named Berno, his confessor and friend, the first abbot. Whereupon Berno suggested that an adequate site would be William’s favorite hunting lodge, at a place called Cluny. Shortly after establishing this legacy, William died. Abbot Berno set to work. He gathered twelve monks, carefully chosen for their piety, and they moved to the lodge. They established prayer and almsgiving as Cluny’s principal business. The monks lived Saint Benedict’s rule to perfection. Silence was absolute, broken only by collective prayer. They said masses in turn from sunrise to midday. They spent hours in spiritual reading and devotions, and distributed help generously to the poor of the district. The handful of young monks quickly came to be loved for their kindness, hard work, and spirit of Christian joy. Like all people imbued with humble divine aspiration, they were exquisitely considerate of others and deeply happy. Consider how William’s gift must have affected the people living in those dark times – to be able to hear the monks singing the Gregorian chants; to observe the orderliness and dedication of their lives; to receive their help and counsel, and not least, their prayers. The tiny monastery with its happy monks must have seemed a heaven-sent anchor, a deep, clear wellspring of meaning, and a tremendous source of hope. It has been said that love is life – the greater and the more selfless the love, the greater the life. The small community at Cluny appeared alive with love for God and His service. Its vigor of spirit contrasted so sharply with the prevailing monastic languor that, remarkably soon, the news of its existence began to spread. Over the next several years, youths in their teens and twenties arrived at Cluny’s gates, drawn by ambition for holiness and service. Through the violent times of the tenth century, the monastery swelled with novices. The name Cluny became synonymous with a life of prayer and sacrifice, a place where men sought to serve God with all their heart and soul, mind and strength. So many postulants came that the monastery spawned others, scattered throughout the continent. Inspired by Cluny’s holiness, monks in other establishments petitioned its abbot to help them set their own communities in order, to reform abuses, reinvigorate discipline, and reinstitute prayer. Still other communities, unassociated with the Cluniac system, imitated its example of sanctity. [In the Middle Ages] it was widely held, by lords and peasants alike, that humankind, if left to itself, was destined for hell. Only one institution was believed to possess the authority to intercede on its behalf on the Day of Judgment – and that was the monastery. Hence the sole hope of salvation, of remission of an individual’s sins, lay with the prayers of the monks. Because they had abandoned the physical world in favor of the spiritual, only they had the ear of God. And the more fervent their prayers, the more inclined God might be to listen. And so, in this frightened and unstable world the monasteries became the ark of salvation, and the monastic ideal acquired a spiritual accreditation that was unquestioned in every walk of human life. The peasant felt comforted by the distant tolling of the abbey bell, and by the knowledge that the devotions of the good monks were putting in a word for him and his family up above. As for the local lord, he could choose to pave his own path to heaven either by ending his days in a monastery, or alternatively by using his wealth to found or endow one. Inevitably, then, the restoration of moral and social order in Europe became primarily the responsibility of the monasteries. The establishment of the Benedictine Order by Benedict of Nursia in 529 AD was a keystone to the stability of European society that would be achieved during the reigns of William and his son, Henry I in the 11th century…. Benedict of Nursia had composed his Rule in the sixth century for the benefit of the monastery he founded at Monte Cassino, in Italy south of Rome. Had it been a rigid and punitive document, Odo [second Abbot of Cluny] might well not have succeeded in imposing it. As it was, the strength of the Rule lay in its balance, gentleness, and humanity. While it demanded complete obedience, personal poverty, and chastity to assure communal stability, there was nothing unnecessarily authoritarian about it. Benedict’s aim had been to offer a succinct and essentially humane directory for the government and well-being of a monastery, set down in a spirit of moderation, and with a frank allowance for human weakness and failure. Monks were to be allowed good food and wine, clothes that were suited to the climate and the seasons, and an opportunity to use a number of manual or creative skills. Each day’s goal was to achieve a balance of prayer, work, and study, four or five hours being recommended for each…. The wide dissemination of St. Benedict’s Rule is largely due to Charlemagne and the scholars of his court, men with a reverence for antique knowledge and the desire to find and copy the original texts of the early church. It is recorded that early in the ninth century the emperor obtained from Monte Cassino a copy of the original version of the Rule. Charlemagne’s teacher and adviser was the renowned English scholar Alcuin, and it was Alcuin who is believed to have urged the emperor to instigate the task of imposing the Rule on a number of lapsed monasteries within his empire. So began a reforming movement within the Benedictine world which was later carried on by Charlemagne’s son, Louis the Pious, and subsequently – and triumphantly – by Cluny itself. By the year 1000, Cluny was at the head of a well-organized system that embraced more than 300 communities throughout France, Italy, Germany, England, Scotland, and Poland. The system’s success lay not in its organizational structure but its spiritual dedication: the love and service of God came first; each monk was to dedicate himself to the imitation of Christ. Whatever task was undertaken, be it farming or teaching or the copying of manuscripts, the principal purpose was that each monk become a saint. Cluny’s life lay in the minds and hearts of its monks. By the twelfth century, Cluny’s network comprised 1,450 communities with more than 10,000 consecrated religious. The simple lodge constructed by William of Aquitaine had grown into a monastic complex with a central church that was more than 550 feet long – the largest church in Christendom until St. Peter’s in Rome was built in the 1500s. Cluny’s library would house the most extensive and precious collections in the world. In its first 90 years, wealthy donors, inspired by Cluny and wishing to bolster its influence, had give the monastery no less than 630 separate gifts of land. With the holy men of Cluny leading the way, the spirit of reform infiltrated the rest of the church, gathering momentum with each generation. Missionaries spread to the forests of northern and eastern Europe, baptizing the descendents of the barbarians who, just two or three generations before, had spread such devastation. New institutions of Christian service arose: schools, hospitals, and orphanages. Thus, only a few generations after the church was pronounced near death, its vitality was renewed, “bringing forth from its treasure new things and old” in what would become known as the Age of Faith. These splendid achievements had their seeds in small, inauspicious beginnings. The repentant Duke William of Aquitaine had no idea how much good God would be able to draw from his generous legacy. In view of what history tells us about the character of King Henry I of England, it is no surprise that in that life, and later as King Alfonso X of Spain, he was an enthusiastic supporter of Cluny. 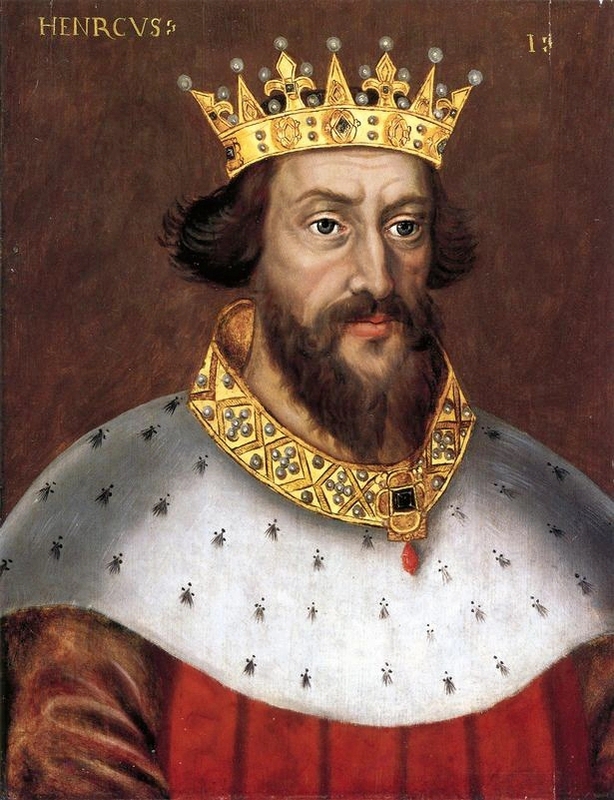 During Henry’s reign, England enjoyed 33 years of unbroken peace, an unheard-of respite from the constant wars that wracked the continent in those violent times. As a proponent of religious reform, Henry focused effort on promoting the foundation of leper hospitals, expanding the provision of nunneries, and supporting the charismatic orders of the Savigniacs and Tironensians. He was an avid collector of artistic relics, sending an embassy to Constantinople in 1118 to collect Byzantine items, some of which were donated to Reading Abbey. Mayeul…cautiously declined Richard’s appeal, perhaps suspicious of risking his charges in a territory that not so long ago had been the domain of brigands. Then early in the eleventh century the duke’s successor, Richard II, was able to persuade the most influential churchman of the day, the Italian-Burgundian monk William of Volpiano, to come to Fecamp and introduce Cluniac discipline to the new abbey. William’s impact on Normandy was huge – before long there was a burgeoning of monastic life in the young dukedom. 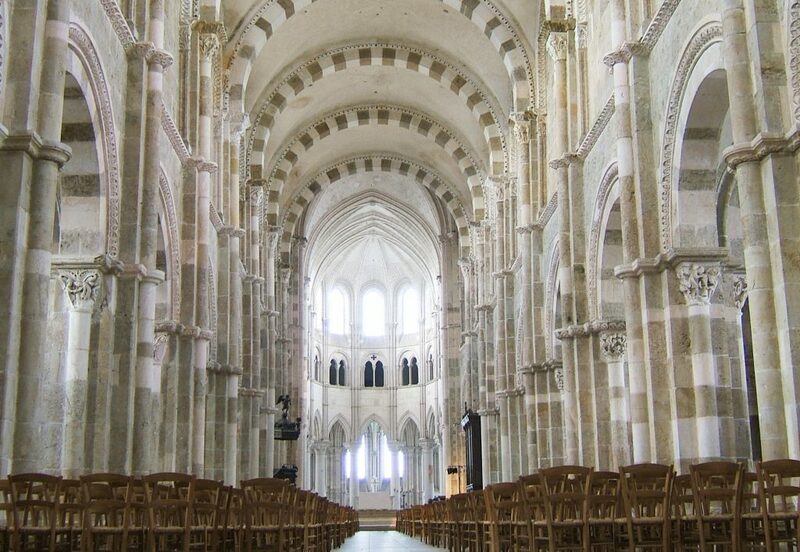 After Fecamp a number of great abbeys were founded, among them Jumieges, Mont-St.-Michel, St.-Ouen, Bernay, Caen, Bec-Hellouin, and St.-Wandrille, until Normandy rapidly became among the most respected centers of learning in Europe, as well as of architecture, sculpture, painting, and music. 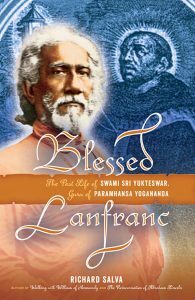 The Italian Benedictine Lanfranc [Sri Yukteswar in that life] was attracted to the new monastery of Bec where he became prior before being appointed the first abbot of St. Stephen’s at Caen (and ultimately Archbishop of Canterbury). Another distinguished Italian scholar, Anselm [Rajarsi Janakananda in that life] followed Lanfranc to Bec, where he became abbot before eventually succeeding Lanfranc as head of the church in England (in which capacity he made a special visit to Cluny in order to renew his relationship with Abbot Hugh). Without the Cluniac ideals of monastic reform as a driving force few of these achievements would have been likely. As it was, the impact of Cluny had in a very short time made itself felt in the newest and most energetic Christian territory in Europe [Normandy]. And from here, since the dukes of Normandy harbored ambitions far beyond their small land, that impact would very soon be carried northwards across the Channel. The most famous date in English history, 1066, also signaled the beginning of Cluniac influence there…. Ever since the Norman Conquest, England had been enjoying a special relationship with Cluny. Initially, under Abbot Hugh [sixth Abbot of Cluny, 1049-1109], this relationship had remained generally cool and impersonal, because of Hugh’s reservations toward William the Conqueror as something of an upstart. By the time Peter the Venerable became abbot, Cluny had already acquired a more open and less demanding supporter in William’s youngest son, Henry, who had become King Henry I in 1100. An English royal charter drawn up by Henry reads, “Let it be known that I have received into my hand and custody and protection the abbey of Cluny.”…. 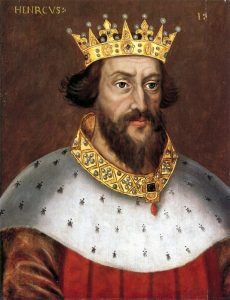 Henry promptly reinforced his insecure position as king of England by marrying a princess from an ancient Anglo-Saxon royal line – Matilda, the daughter of the king of Scotland. Henry’s own connection with Cluny seems to have been greatly strengthened by his marriage to Matilda. Between them, as Peter the Venerable acknowledged with profound gratitude, they took over from the Spanish kings as the principal benefactors of the abbey. In addition to his decisive contribution to the roof repair of the abbey church Henry made other valuable gifts both to Cluny itself and to its eldest daughter house a short distance away, the priory of La Charite-sur-Loire. Matilda made her own contribution to the new abbey church in spectacular style – a giant seven-branched candelabrum which was an imaginary replica of the one in the Tabernacle described in the book of Exodus…. Meanwhile King Henry continued to shower favors on Cluny. By the time Peter became abbot of Cluny William [son of Henry I] was dead, drowned along with many other members of the royal household when his ship, known as the White Ship, foundered and sank shortly after leaving the Norman port of Barfleur In November 1120. A year later King Henry founded Reading Abbey, motivated largely by the tragic death of his son. Henry laid the foundation stone himself, and wrote to Cluny requesting that he be sent as many monks as could be spared in order to help establish the new abbey on Cluniac lines. His plan was to supplement these with other monks drawn from Lewes Priory, which had been founded under the aegis of his father, William the Conqueror…. Burial of Henry I at Reading Abbey. 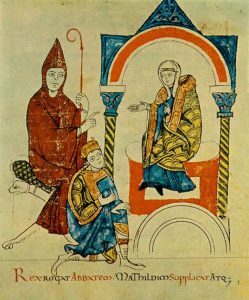 A letter from the king to the abbot survives: “Henry, King of England and Duke of Normandy, to the Abbot and Convent of Reading, greeting. Know ye that the glorious hand of the blessed James the Apostle, which Empress Matilda, my daughter, gave me… I, at her request, send to you and grant for ever to the Church of Reading….” (Henry’s reference to himself as Duke of Normandy is pertinent. The man who legally held that title was actually his elder brother Robert Curthose, whom Henry had defeated in battle and proceeded to hold in prison for the remainder of his life.)…. 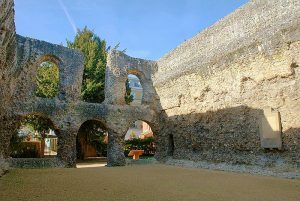 Reading Abbey: remains of the chapter house. 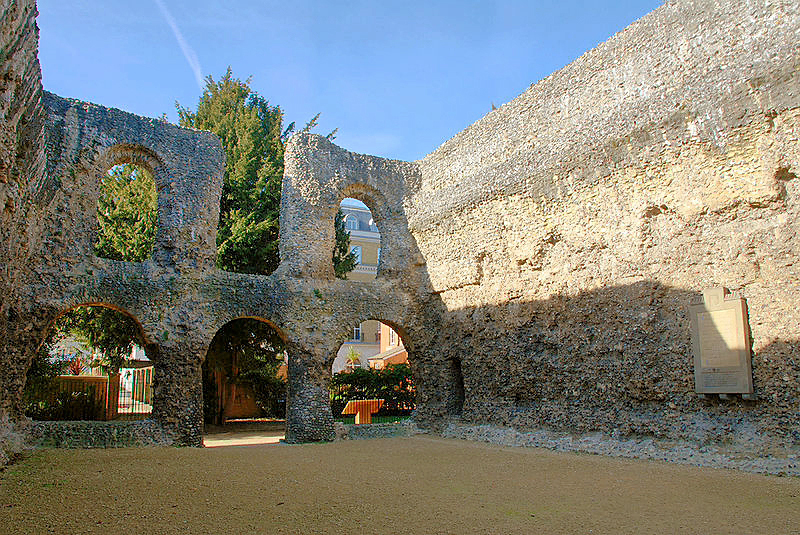 Reading Abbey was founded by one Henry and destroyed in 1539 by another – Henry VIII. In the centuries between it became the most important Cluniac link with England, more so even than Lewes Priory, though it always remained independent of Cluny’s direct authority while continuing to observe the abbey’s rules and practices. One reason for the elevated status of Reading Abbey was the lavishness of its royal endowment. More important still was the wealth of the relics it held. The abbey, like so many other Cluniac churches, was constructed with a generous ambulatory so that pilgrims could circulate round and behind the high altar on feast days in order to appreciate the precious relics on view. And what a collection lay before them. The celebrated hand of St. James may have been the principal object of reverence, but there were others not far behind: a piece of Christ’s shoe, a phial containing blood from his side, some hair and garments of the Virgin Mary, the robe of Doubting Thomas, a tooth of St. Luke, bits of Aaron’s rod, a fragment of the rock which Moses struck, a piece of the Holy Cross, and – in the eyes of the pilgrims of lesser worth – various fingers belonging to minor Christian martyrs. 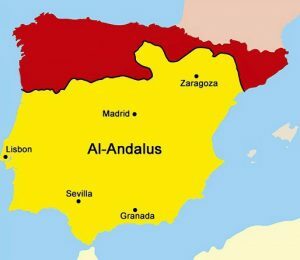 Map of Spain, showing the extent of Islamic rule at the time of Cluny’s founding. A major pilgrimage route led across the northern, Christian portion to Santiago de Compostela in the west. But the chief focus of his zeal [Odilo, fourth Abbot of Cluny 994-1049] was not Italy, but Spain. A century before the First Crusade and the goal of liberating the Holy Land, Christian eyes had become focused on the Iberian peninsula. It was here that Islam remained the most potent threat. Throughout the ninth and tenth centuries Moorish armies had repeatedly harried Christian lands, even driving north of the Pyrenees and deep into France. In 929 the caliphate of Cordoba had been established, politically independent of Baghdad and marking the fact that the epicenter of Islamic culture and military organization had now shifted west. Pamplona, capital of Navarre, had already fallen to the Moors. Finally, at more or less the moment when Odilo became abbot, Santiago de Compostela fell. It was only a brief period of conquest, scarcely more than a raid; but Santiago, so named after the apostle St. James the Greater who was supposedly buried there, was a shrine of special veneration, before long due to become the most esteemed place of pilgrimage in all of Europe. This was Odilo’s inheritance. And throughout the long years of his abbacy it was the Christian reconquest of Spain that was to remain his most burning ambition…. So it was under Odilo’s abbacy that Cluny, with the support of the papacy, first used its prestige, its money, and its powerful feudal connections to come to the aid of the beleaguered Christian kingdoms in northern Spain. From the year 1017, and on into the next century, the abbots of Cluny are known to have promoted, or at the very least approved, no fewer than twenty military expeditions into the Iberian peninsula. Swami Kriyananda observes in Cities of Light that art and religion have always been necessary partners in the birth of great civilizations. Religious renewal gives the soul and mind a sense of life’s meaning, and art translates the revelation into terms that can be understood with the heart. Henry saw to it that the abbey at Reading would be notable for its artistic embellishments. It had an extremely elaborate cloister, several fragments of which can be seen in the town museum. The cloister capitals are carved with elaborate monsters, and the arches of the cloister arcade are made up of amusing pointed heads, often of birds with sharp beaks. In short, Reading was definitely designed in the Cluniac style. Cluny was a monastic movement that communicated its message to the lay faithful through charity and service, teaching, and art. Although Cluniac churches were built according to strict, traditional mathematical formulae, the Cluniac style in sculpture was almost unbelievably imaginative. 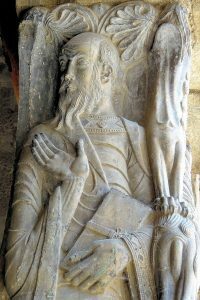 Lord Clark questions the assertion by some art historians that the outlandish figures that adorn the capitals and reliefs in Cluniac churches had some sort of biblical meaning. Clark believed they were simply the expression of the sculptors’ exuberant fancy. 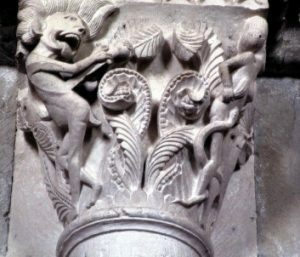 Vezelay Abbey, capital carving of Lust and Despair. St. Bernard of Clairvaux (d. 1153) disliked Cluniac “ostentatiousness” in art, but even he acknowledged its “endless varieties of forms … fashioned with marvelous subtlety of art” (Apologia ad Guillelmum, c. 1125). Through the enrichment of decoration with meaningful and systematic symbolism, the Cluniacs made one of their most important contributions to the development of medieval art…. Very active in the arts, the Cluniacs were responsible for bringing to fruition the Romanesque style, especially in France. It was during his abbacy that Cluniac art reached its zenith. What must have been the effect on ordinary people of the wildly optimistic art at Cluny and its dependent monasteries? Lord Clark points out that for the people of those times, who might not have seen any art or heard any uplifting music for weeks on end, the effect of the chanting, sculpture, paintings, and illustrated manuscripts in the monasteries must have been stupendous. In those distant days it was the monasteries that held a vital key to the shaping of a new Europe. They acted as colleges, patrons of art and architecture, moral guardians, benevolent landlords, founders of social services, centers of capital wealth, as well as being institutions of vast political influence on an international scale, with the ear of kings, emperors, and popes…. Far from being the product of a hair-shirt culture in a great many fields it is a legacy of serene beauty and sophistication that we still admire a thousand years later…. The Cluniacs used the power of beautiful music and lavish decoration to intensify their religious experience. At Cluny, the central activity was the liturgy; it was extensive and beautifully presented in inspiring surroundings, reflecting the new personally-felt wave of piety of the 11th century. Monastic intercession was believed indispensable to achieving a state of grace, and lay rulers competed to be remembered in Cluny’s endless prayers; this inspired the endowments in land and benefices that made other arts possible…. In music the Cluniac psalmody remains the finest example of Gregorian chant ever composed – it can hardly be an accident that the tunnel vaulting which Cluny’s stonemasons perfected for their churches produces an acoustic that is ideally suited to the resonant chanting of a monastic choir. To listen to these psalms sung in one of the Romanesque churches of Burgundy raised by Cluniac masons is enough to dispel any thoughts of hellfire and damnation. An example: choir sings at vespers in the Abbey Church at Vezelay. The chanting in the video is not entirely uplifting, but it shows the wonderful acoustics of the church. Swami Kriyananda said of the Gregorian chants that they expressed perfectly the high purpose to which the medieval monks had dedicated their lives. They were an important part of the glue that held the monasteries together. 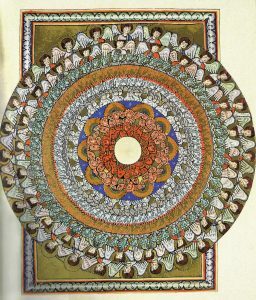 Cluniac sculpture developed from manuscript illustrations, the expected source in an intellectual order. St. Benedict’s Rule required each monk to read one book during Lent, and the library at Cluny possessed some 570 volumes in the 12th century. 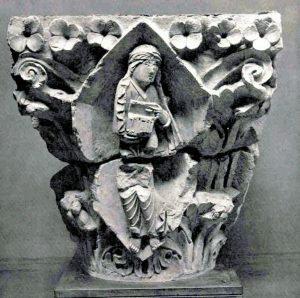 Nowhere is the relationship between manuscript illustration and sculpture more clearly seen than by comparing the cloister plaques at Moissac (c. 1100) with manuscripts known to have been at the Cluniac abbey. However, the most artistically complete treatment of iconographic themes is to be found at Cluny III itself. The now-destroyed “Christ in Glory” with symbols of the evangelists of the central west tympanum (carved c. 1115; destroyed 1810) was “painted like a manuscript page” and was the first large sculptural expression of this theme, the forerunner of many such portals extending in time well into the Gothic…. This consummate combining of theme and style is most evident in the ambulatory capitals surviving from the chevet of Cluny III, consecrated Oct. 25, 1095, by Pope Urban II (Musée Ochier, Cluny)…. Inspired by the writings of Radulphus Glaber, they included the four seasons, the cardinal virtues, the four trees (a new subject), and the four rivers of paradise. Two capitals from the ambulatory represented the eight tones of the chant; they indicate a link between Cluniac liturgy and art. These personifications of the musical tones, based on a late 11th-century tonarius manuscript from Saint-Martial at Limoges (Paris, Bibl. Nat., MS lat. 1118), are among the finest of all early Romanesque capitals and demonstrate fully how the Cluniacs gave sculptural substance to musical and allegorical themes…. Through the enrichment of decoration with meaningful and systematic symbolism, the Cluniacs made one of their most important contributions to the development of medieval art. The fast-growing community at Cluny required buildings on a large scale. The examples at Cluny profoundly affected architectural practice in Western Europe from the tenth through the twelfth centuries. The three successive churches are conventionally called Cluny I, II and III. The construction of Cluny II, ca. 955–981, begun after the destructive Hungarian raids of 953 led the tendency for Burgundian churches to be stone-vaulted…. Hugh’s [fourth abbot of Cluny, 1049-1109] principal legacy is something that no longer exists – the great abbey church which Christopher Brooke has described as “the supreme expression of scale, proportion, decoration, wealth of ornament, richness of liturgy and music, in the Europe of the early twelfth century.”…. The Cluniacs were among the most lavish and enlightened builders Europe has ever known, and the landscape of western Europe remains richly decorated with their achievements. They may have built for God, but the beneficiary has been humanity. In stone carving and wall painting, metalwork and book illumination, they were pioneers responsible for some of the most beautiful art of the Middle Ages…. None of it is the art of doom – quite the reverse. Everything the Cluniacs produced, whether it was sculptures, frescoes, illuminated manuscripts, decorative arts, or liturgical music, rises triumphantly above the bigoted world in which it was created. Maybe there is a connection here – forbidden to create actual life, they poured their creativity into symbolic things. The art inspired by Cluny is grandiloquent and uplifting – it is the art of men who have seen the light, and are glorying in it. In their eyes richness and splendor spoke not of human vanity but of the glories of heaven…. It is here that Mayeul’s [fourth Abbot of Cluny, 964-994] second, even larger, contribution to the story of Cluny comes into play. 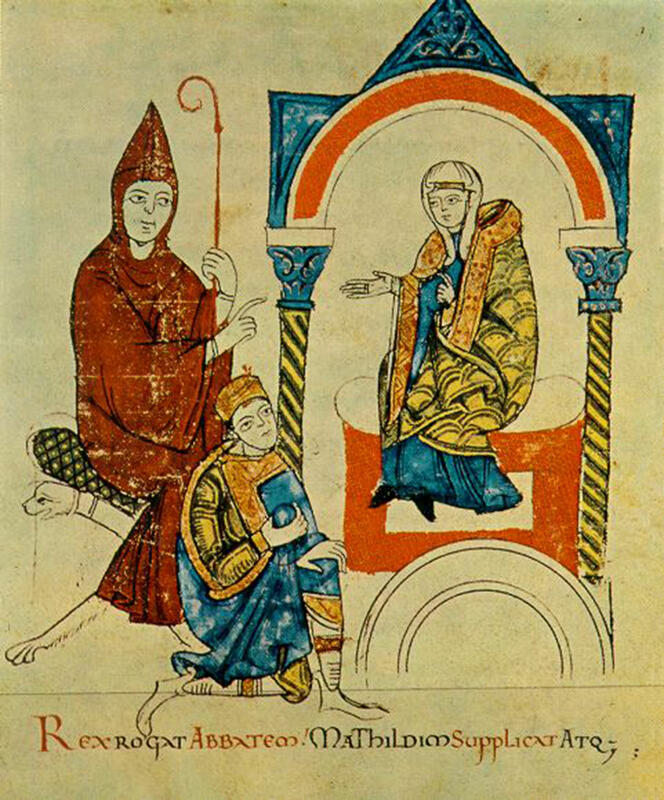 In the year 987 he used his prestige as abbot, and no doubt his aristocratic connections, to persuade one of the most remarkable men of his day to come to Cluny, an Italian nobleman whose relatives included just about every living grandee in Europe, and his godmother was the wife of the Holy Roman emperor. It would have been hard to be better connected. This paragon was William (or Guglielmo) of Volpiano, and he was neither a prince nor a duke, but a young monk – at the abbey of San Michele de Locedia in the Piedmont region of northern Italy…. William of Volpiano shared with the abbots of Cluny a determination to reform monasteries whose way of life had lapsed. Furthermore, and of particular significance in the context of Cluny, he was also a highly gifted designer. He was in effect (to use a modern term) an architect. And it was in this capacity that this aristocratic monk occupies a special niche in history, because it was he more than anyone who was responsible for establishing the first truly international style of church architecture in Europe. He was the father of the Romanesque or, more accurately, its godfather. The term “Romanesque” describes, broadly speaking, a style of building which is derived from what was known of Ancient Roman architecture. When applied to early medieval churches it is identified by such features as rounded arches and windows, simple classical columns with carved capitals, and usually a rounded apse beyond the altar at the eastern end. It became the predominant form of church architecture for over two hundred years until the evolution of the Gothic style late in the twelfth century. 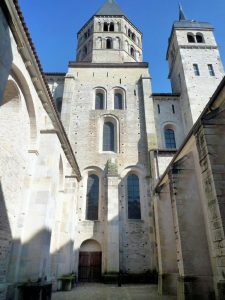 But even though Romanesque architecture embraces a broad variety of buildings, from vast cathedrals to thousands of village churches right across Europe, it was actually born in monasteries; and if not exactly born in Burgundy, then it first grew and flourished there under the aegis of Cluny. To this day many of the towns and villages in the region possess Romanesque parish churches in a distinctive Burgundian style, which owes it origin to the talents of William of Volpiano and to the power and initiative of a succession of abbots of Cluny…. In the course of their travels they would have absorbed local skills and traditions, and certainly they would have trained local talent wherever they went, as a result of which Cluny itself soon came to possess its own stonemason’s yard with its own builders and carvers who within a hundred years were to become the most gifted sculptors in Europe. But that is looking further ahead. Among the special skills which these early craftsmen brought with them from Lombardy was that of stone vaulting – and this was to prove particularly valuable to Cluny at a time when ever-increasing gifts of land and property were necessitating the building of numerous new churches in the region. (The astonishing number of 630 such gifts is recorded between the foundation of Cluny in 910 and the year 980.) 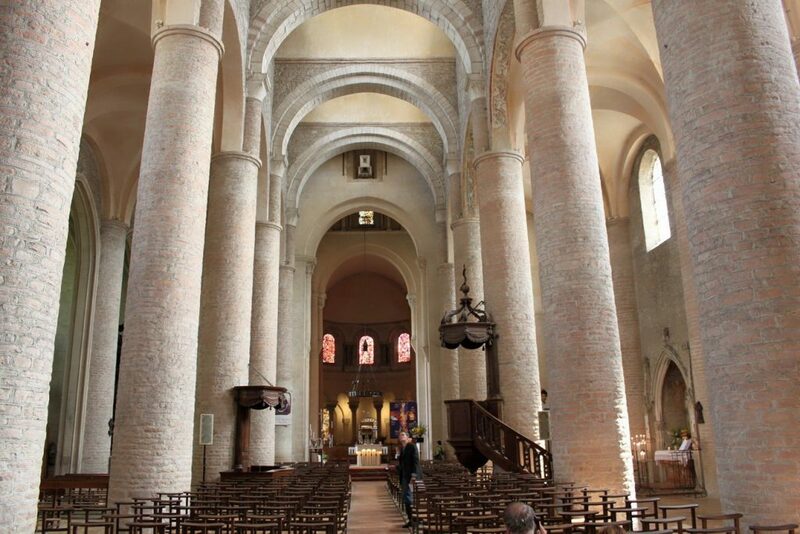 Stone vaulting, replacing the highly flammable wooden roofs of pre-Romanesque church buildings, allowed the creation of spacious interiors, the roof supported by massive walls and solid columns. The Lombards also developed a new kind of wall construction which was both decorative and extremely practical – small stones being split into bricklike shapes laid diagonally in high-quality mortar to form rhythmical patterns, sometimes varied by irregular stones or rounded river pebbles. For all their ambitious undertakings the Lombards’ building methods remained rudimentary and traditional. Measuring tools consisted simply of knotted ropes and cords; a rope would bear a knot every twelve inches, marking out what was a Roman foot (which in itself suggests just how long such a system had been employed). As for matters of design, symbolism ruled in everything they did; nothing was without a hidden sacred meaning, developed by philosophers and theologians over many centuries. The dimensions of an entire church were determined by sacred geometry. The number Seven was especially holy; it symbolized the seven days of creation, and was the sum of Three, representing the Holy Trinity, and Four, which stood for the earth. A church would have seven altars, and its apse seven blind arches; candelabra would be seven-branched; columns would be set precisely seven feet apart. Gregorian chant consisted of eight tones, and some towers were built as octagons, because Eight was the number of the new creation – the “eighth day,” when the divine order was completed. There was even a practice of making a church nave 153 feet wide, this being believed to be the number of fish caught by St. Peter in the Miraculous Draft of Fishes. Symbolism was of importance because it was the way the medieval mind worked. The physical world was perceived to be a mere echo of the celestial, and therefore needed to be defined in terms that related to that celestial world…. The character of southern Burgundy today is to a considerable extent the creation of these Lombard craftsmen. The churches they built, with their tall distinctive towers, still dominate the landscape, particularly in the area around Macon – the Miconnais region…. To this day St. Philibert is one of the most strikingly beautiful buildings in France. It is Lombard work at its most triumphant. The great flank of the church is a testimony not just to the Lombards’ building prowess but to the way they could combine those rugged skills with a gift for the most delicate ornamentation in stone – motifs that we see repeated in church after church in the Miconnais. What could otherwise have been a bare cliff of stone is made subtle, almost soft like embroidery. Vertical bands of blind arches are set into the wall, and these are accompanied by a tracery of saw-edged moldings and strips of zigzag stonework, all of which combine to make the wall itself appear multilayered instead of flat…. Now workshops were springing up all over the place, dictated by demand. The Cluniac patrons and paymasters were happy to take advantage of whatever local talent was available, and in addition masons and master carvers now headed for Burgundy from any number of different regions, either to work on the great abbey church itself or on one of the smaller churches being built in the towns and villages of the Maconnais and Brionnais regions. As a result there is little consistency of style, or of quality, about the carvings decorating the new Burgundian churches. It is hard to define the “art of Cluny” since Cluniac sculpture varies so widely from church to church – between the lyrical and the phantasmagoric, the stiff and the fluid, the sophisticated and the primitive. At its finest there is a warm humanist spirit about Cluniac stone carving, a feeling of sensuous joy at the living world…. Abbey of St. Pierre at Moissac, South Portal, Tympanum. 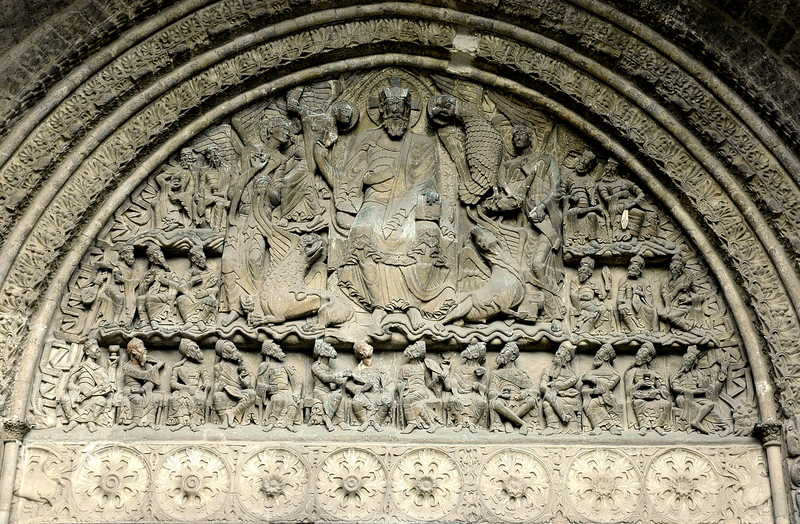 The tympanum above the south portal at Moissac makes one regret even more the loss of the tympanum at Cluny. 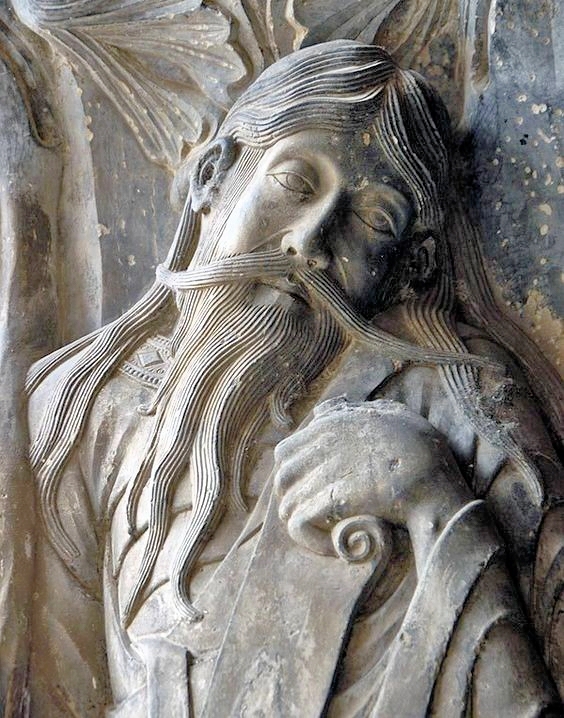 Certainly the Moissac sculptor – and we do not know who he was – looked to Burgundy for inspiration. Christ in Majesty is seated gravely in the center, above the lintel. 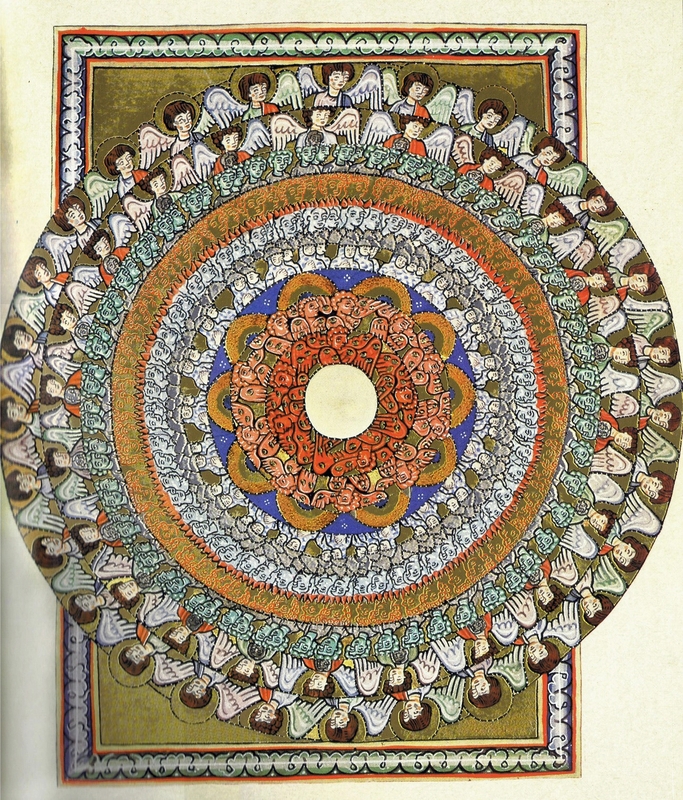 Around him are the symbols of the four evangelists, while below him and on either side the familiar twenty-four elders of the Apocalypse are for once engaged in the action – they have set aside their musical instruments and turned their heads upwards in astonishment. Throughout the entire tympanum the sculptor has created an atmosphere of awestruck silence. This is sculpture as drama…. But the most striking feature of the Moissac portal is all but hidden as one stands facing those twin doors. 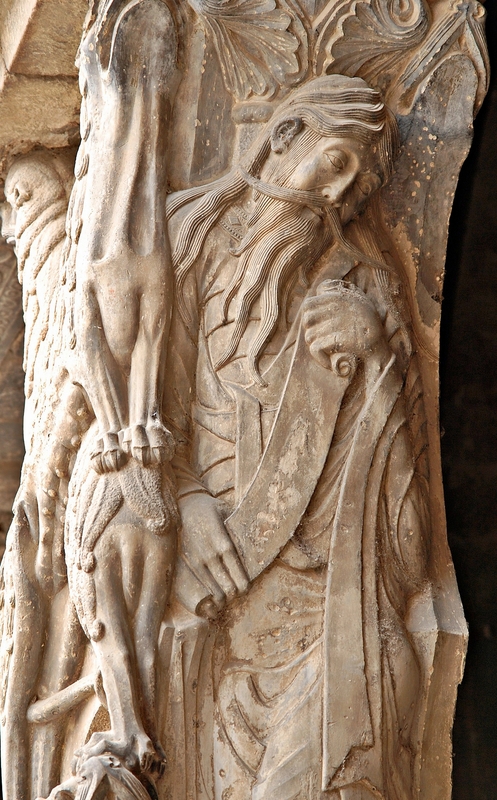 On the lion column’s two sides, flattened into the stone so that they only become visible as one passes under the lintel, are two full-size figures, on the left the apostle Paul and on the right the prophet Jeremiah. 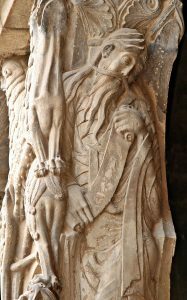 Jeremiah, detail; carving on column at Moissac Abbey. if actually combed. Jeremiah’s body is twisted, his head turned slightly so that he looks away from us lost in thought, an expression of benign sadness on his ace. He is the prophet who sees only doom, and can do nothing about it. This is sculpture that searches deep, laying bare something of the human soul. Only the greatest artists in any era have made intractable stone express the inner self – and the sculptor of these Moissac figures is one of them. Few examples of European art portray so eloquently the passionate and mystical nature of the medieval religious experience. 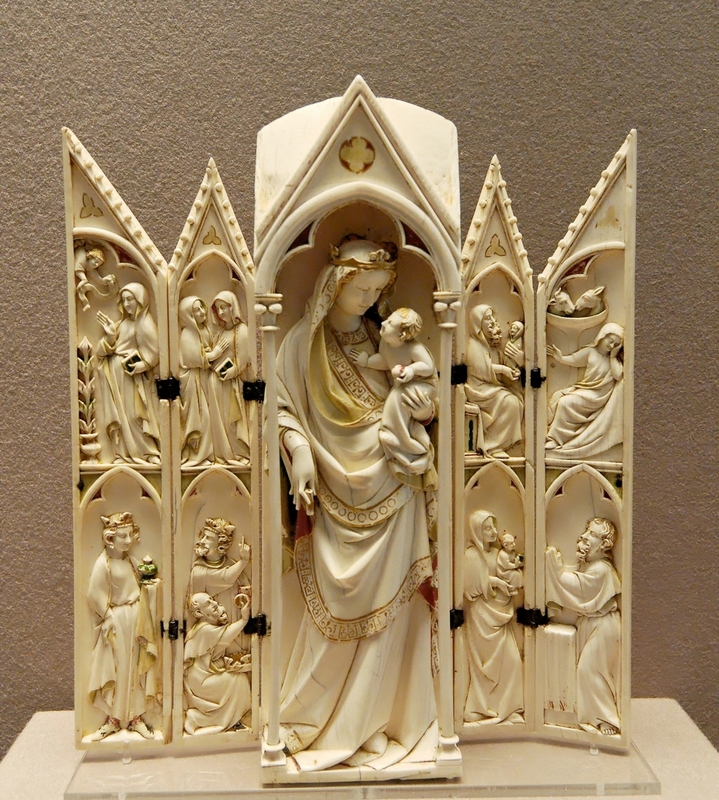 This is Cluniac art at its finest, matched only by two other sculptural masterpieces – the great portals of the abbey church at Vézelay and the cathedral of St. Lazare at Autun, both in Burgundy, and both intimately connected to Cluny…. Cluniac wall painting, too, is a rarity. The finest example which has survived is the large fresco of Christ in Majesty in the apse of the Chapelle des Moines at the former grange, or priory, of Berzela-Ville, Abbot Hugh’s favorite retreat…. The most important single Cluniac manifestation of Romanesque style was the great church of Saints Peter and Paul constructed at Cluny under Abbots Hugh of Cluny (1049–1109) and Peter the Venerable between its official founding, Sept. 30, 1088, and its formal dedication by Pope Innocent II, Oct. 25, 1130. …. Built on the plan of a double-armed archiepiscopal cross, Cluny III was over 600 feet in length, including a Gothic narthex completed about 1225, and reached an interior vaulted height of 100 feet for the first time in medieval architecture. 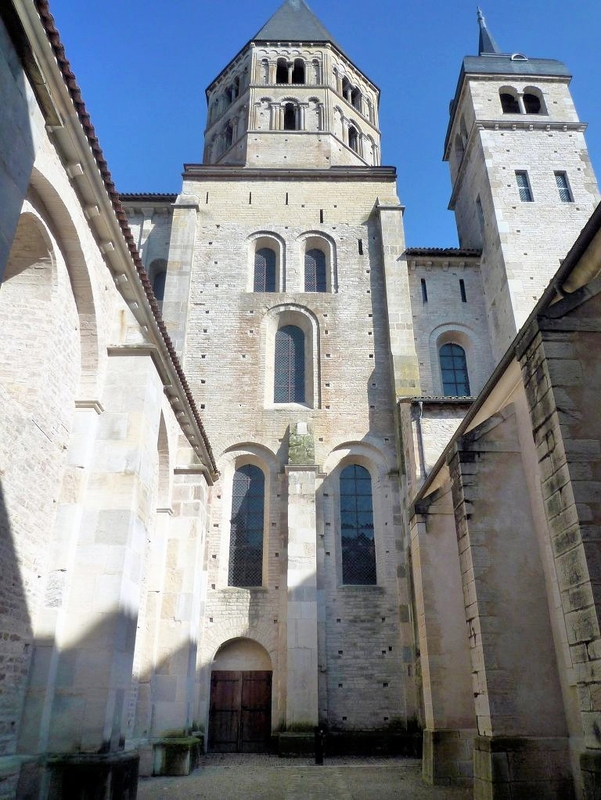 This feat duly impressed a chronicler in 1120, who wrote, “… and suddenly [as one enters the nave] a giant basilica surges up….” As capital church of the Cluniac congregation of Benedictines, Cluny III was able to hold all the monks of the order; in 1132 there were 1,212 monks assembled in procession in the church. Medieval visitors were no less impressed by its workmanship than by its size; later visitors were equally awed by its total effect: “If you see its majesty a hundred times, you are overwhelmed on each occasion” (Mabillon, 1682). The Cluny library was one of the richest and most important in France and Europe. It was a storehouse of numerous very valuable manuscripts. During the religious conflicts of 1562, the Huguenots sacked the abbey, destroying or dispersing many of the manuscripts. Of those that were left, some were burned in 1790 by a rioting mob during the French Revolution. Others still were stored away in the Cluny town hall. The French Government worked to relocate such treasures, including those that ended up in private hands. They are now held by the Bibliothèque Nationale de France at Paris. The British Museum holds some sixty or so charters originating from Cluny…. A short distance from the great cloister was the abbey library, which in the early days was little more than a book cupboard (armarium). All books were handwritten on parchment and thus a rare treasure; they were highly valued at Cluny as part of a monk’s religious education, and during the summer months two hours a day were set aside for the brethren to read in the cloister…. A place of special pride at Cluny was the scriptorium. The copying and illumination of manuscripts was one of the abbey’s finest achievements, and was the only artistic activity actually [performed by monks]. The Basilica of Saint Denis is a large medieval abbey church in the city of Saint-Denis, now a northern suburb of Paris. The building is of unique importance historically and architecturally as its choir, completed in 1144, shows the first use of all of the elements of Gothic architecture. 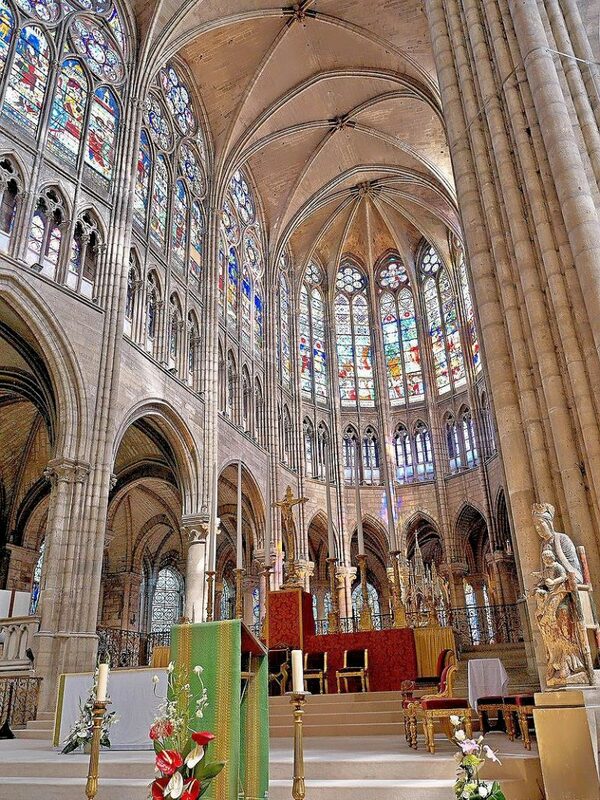 Saint Denis was rebuilt on the site of an earlier Carolingian church, begun in 754, about which little is known…. In addition to this revolution in theory, Suger’s St. Denis was also the beginning of many new developments in practice, in architecture, in sculpture, in painted glass. Suger introduced, perhaps really invented, the Gothic style of architecture, not only the pointed arch, but the lightness of high windows, and he introduced the idea of the rose window and painted glass and porticoes with rows of standing figures. To form any notion of its first effect on the mind one must go to Chartres. The south tower is still as it was when completed in 1164. It is a masterpiece of harmonious proportions. To the medieval man geometry was a divine activity. The main portal has a congregation of beautiful figures. There was far more Greek sculpture visible in the twelfth century than anyone used to realize. And this style was particularly appropriate to Chartres, because it was there that men first began seriously to study Plato and Aristotle. In the arch of the right-hand door Aristotle and Pythagoras are represented. The kings and queens of Chartres show a new stage in the ascent of western man. Beside them the gods and heroes of ancient Greece look arrogant, soulless and even slightly brutal. To build this cathedral men and women came from far away carrying heavy burdens of provisions for the workmen – wine, oil, corn. Amongst them were lords and ladies, pulling carts with the rest. There was perfect discipline, and a most profound silence. Two great churches were re-built in the 12th century, as if to mark the death of an older era and celebrate the dawning of something new. The former churches at St. Denis and Chartres had burned down, as if to clear the way for the expression of a new thought. Another completely new religious expression was the Cult of Mary, which found its first exemplar at St. Denis. Until this time, no Christian art had featured Mary as a special object of adoration. Chartres contained a relic, the tunic Mary wore during the Annunciation, since 876. From the first it worked miracles, but only in the twelfth century did the cult of the virgin appeal to the popular imagination. Perhaps earlier life was simply too rough. The earliest cult figure of the Virgin and child of any size is a painted wooden statue in St Denis. No Romanesque churches were dedicated to the virgin. Then after Chartres the greatest churches in France were dedicated to her. Why this change? The crusades? Returning warriors tired of fighting who wanted to worship gentleness and compassion? This would seem to be confirmed by the fact that the first representations of the Virgin as an object of devotion are in a markedly Byzantine style. St Bernard, who preached the second crusade at the Cluniac abbey of Vezelay, was one of the first men to speak of the virgin as an ideal of beauty and a mediator between man and God. Dante was right to put into his mouth at the close of the Paradiso (1320) a hymn to the Virgin which I think one of the most beautiful pieces of poetry ever written. 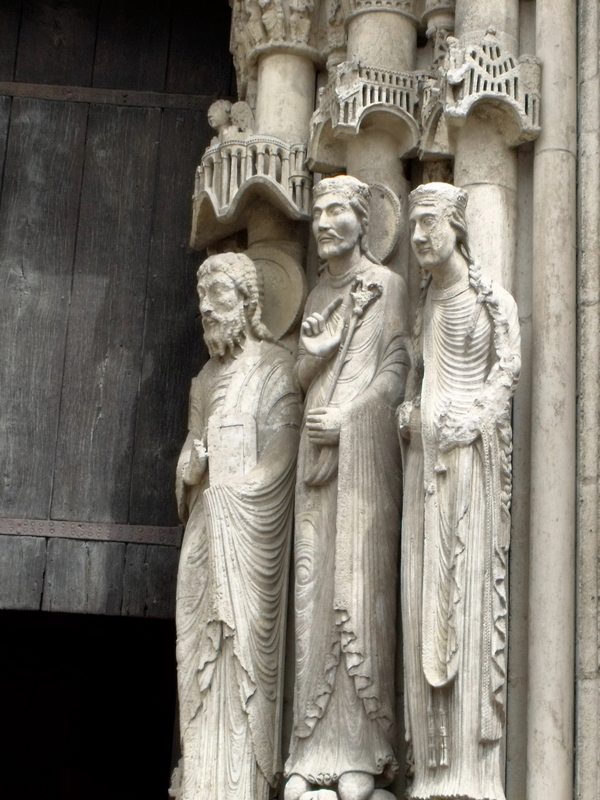 The old Romanesque Chartres cathedral had been destroyed by a terrible fire in 1194. Only the towers and the west front remained. When the debris was cleared the relic was found intact and the Virgin’s intentions became clear, that a new church should be built, even more splendid than the last. People came from all over France to pitch in. The building is in the new architectural style to which Suger had given the impress of his authority at St Denis: What we now call gothic. To make it higher on the same foundation, flying buttresses were invented. This made possible the weightless expression of spirit. Suger also used the pointed arch and glass for more light. Chartres is the epitome of the first great awakening in European civilisation. It is also the bridge between Romanesque and Gothic, between the world of Abelard and the world of St. Thomas Aquinas, the world of restless curiosity and the world of system and order. Interestingly, King Alfonso X of Castile (Swami Kriyananda in a former life, 1221-1284) composed 427 songs in praise of the Virgin Mary. His Cantigas de Santa Maria, which are still performed today, must have lent energy to the awakening awareness of Mary as a compassionate intercessor between man and God. Historians generally agree that the Cantigas did not spread widely among the common people. However, it seems they were known to the higher clergy, and would have helped to spread the worship of Mary. Swami Kriyananda traces the roots of the Renaissance (1300-1600) to St. Francis (1181/82 – 1226), who, with the Canticle of the Creatures, introduced the idea that God can be worshipped through the forms in which He expresses Himself in His creation. The Cluny that Peter the Venerable [Cluny’s ninth abbot, 1122-1156] had inherited in the 1120s was unique in a number of respects. It was unequalled in the breadth and scope of its monastic empire, stretching as it did across much of Europe and as far as the Holy Land. And in proportion to the quantity of properties it administered – and in many cases built – Cluny had also become a patron of the arts on a massive scale, not only in the fields of architecture and sculpture, but in mural painting, music, manuscript illumination, and all aspects of the decorative arts, from fine metalwork and ivory carving to the most elaborate gilding and enameling. In addition the abbey possessed one of the richest libraries in Europe, including works of classical literature and Latin translations of the Greek philosophers, soon to be supplemented at Peter’s instigation by scientific works on astronomy and algebra translated from the Arabic. Altogether the abbey had become not simply a monastery but a seat of learning, where respect for knowledge extended far beyond the conventional study of theology and the lives of the saints. Cluny had moved a considerable distance from being the sheltered island of simple prayer and plainsong it had once been. Now, with a scholar as its abbot it had begun to acquire much of the sophistication and intellectual vitality associated with the emerging universities. In the fragmented and localized Europe of the 10th and 11th centuries, the Cluniac network extended its reforming influence far. 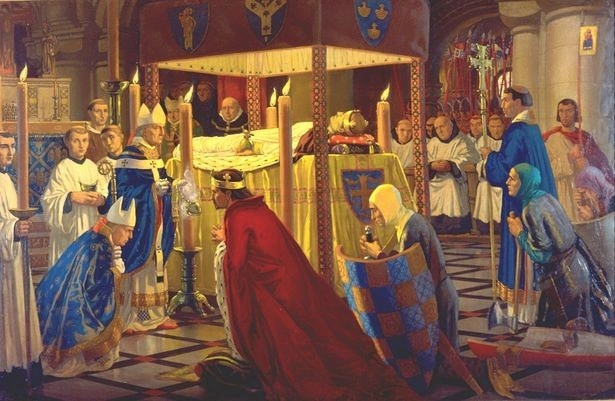 Free of lay and episcopal interference, responsible only to the papacy, which was in a state of weakness and disorder with rival popes supported by competing nobles, the Cluniac spirit was felt revitalizing the Norman church, reorganizing the royal French monastery at Fleury and inspiring St Dunstan in England…. Well-born and educated Cluniac priors worked eagerly with local royal and aristocratic patrons of their houses, filled responsible positions in their chanceries and were appointed to bishoprics. Cluny spread the custom of veneration of the king as patron and support of the Church, and in turn the conduct of 11th-century kings, and their spiritual outlook, appeared to undergo a change…. Within his order, the Abbot of Cluny was free to assign any monk to any house; he created a fluid structure around a central authority that was to become a feature of the royal chanceries of England and of France, and of the bureaucracy of the great independent dukes, such as that of Burgundy. Cluny’s highly centralized hierarchy was a training ground for Catholic prelates: four monks of Cluny became popes: Gregory VII, Urban II, Paschal II and Urban V.
An orderly succession of able and educated abbots, drawn from the highest aristocratic circles, led Cluny, and the first six abbots of Cluny were all canonized…. The Cluniac Abbey of Vezelay is full of sculpture. I can think of no other Romanesque interior that has this quality of lightness, this feeling of Divine reason. And it seems inevitable that this Romanesque should emerge into a beautiful early gothic. The Cluniac movement spawned an intellectual renaissance as well, in part due to its efforts to acquire early Greek and Roman works for its libraries; in part because the spiritual renaissance powerfully affected the spirit of the times. All of these events led to the possibility of the famed scholar Peter Abelard. It was the Clunys who saved Abelard from excommunication for his revolutionary views. To a large extent their [the abbots of Cluny] position of importance arose as a result of the prevailing chaos of the times. The empire forged by Charlemagne in the late eighth century broke apart not long after its creator’s death in 814, due chiefly to the absence of any leader powerful enough to hold it together in the face of so many warring factions. As a result there followed a lengthy period of political anarchy throughout much of the continent. During the ninth and early tenth centuries marauders from three sides – north, east, and south – took full advantage of the fragility of western Europe. 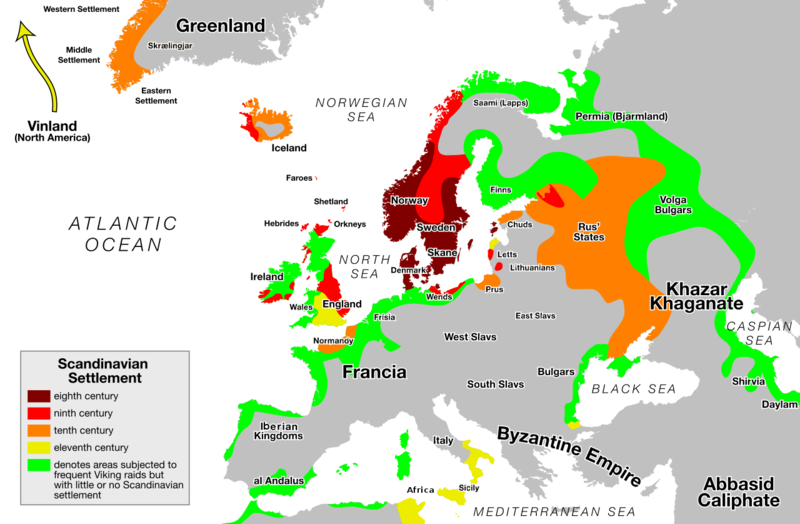 Magyars, Vikings, and Saracens descended in repeated waves of pillage and plunder. Nowhere was safe, and the Christian world was afraid…. Bishop Fulbert of Chartres once described Odilo [Odilo, fifth abbot of Cluny, 994-1049] as “the archangel of monks.” Odilo’s drive and achievements were awesome, and by his death there was no longer any doubt in the Christian world that Cluny was the most important monastery in Europe, and that its abbots were by now as powerful as the Holy Roman emperor and the pope – perhaps more influential in church matters than the Emperor, and certainly more politically powerful than the pope. This extraordinary expansion, both in property and influence, was the direct result of the social and political condition of the times. While Cluny’s very existence depended on the feudal structure of medieval society, with its rigidly defined class system reaching down from noblemen to serfs and slaves, it also lay above and apart from that feudal world, and therefore above and apart from its relentless quarrels and power struggles; and this was part of the abbey’s huge strength. In addition to being able to offer moral security, Cluny could also act as a mediator in those quarrels…. The abbots of Cluny became the brokers of peace, a kind of United Nations of its day, or, perhaps more accurately, the ombudsman. He [Abbot Hugh, sixth abbot of Cluny, 1049-1109] is a man we know better by his deeds than by his personality, which we can do little more than deduce from the reactions of those around him. By the broadest of assessments Hugh was clearly quite extraordinary; no average human being could have built and controlled such an empire, retaining at the same time the respect, and often affection, of so many prominent men of the day whom he knew and worked with. The list is remarkable: it included nine successive popes, three Holy Roman emperors, and several kings of Spain and France, not to mention William the Conqueror in England with whom Hugh corresponded on church matters. In the course of that long life Hugh acted as counselor, mediator, guide, and trusted friend to the leaders of much of Europe…. Holy Roman Emperor Henry IV prays to abbot Hugh of Cluny and pleads with Matilda of Canossa, from Vita Mathildis, c. 1115. Under Abbot Hugh the monastery of Cluny became the hub of a wheel whose spokes extended to every country in Europe, and before long as far as the Holy Land. His personal influence was of a kind hard to measure in modern terms… We may find their [the abbots’] equivalent in the workings of diplomatic and commercial coteries of our own day, where whom one knows may be more important than what one knows; but there can be no equivalent of the kind of moral weight that the abbot of Cluny could bring to bear upon international disputes and the squabbles of kings and princes in medieval Europe. Popes and Holy Roman emperors regularly claimed such authority; unfortunately the German emperors were too often at loggerheads with their own princelings to have much spare time for spiritual matters, while the papacy at this period in history was still too politically weak to have the clout to enforce that authority. Only the monasteries, and above all Cluny (at least until the rise of the Cistercians), were sufficiently removed from the crude realities of worldly events, and sufficiently unblemished in their dedicated way of life, to be able to command that moral high ground. Hugh’s list of autocrats to whom he found himself acting as advisor is an impressive one…. What he [Abbot Hugh] also bequeathed was a Cluniac empire that now stretched across the continent of Europe and beyond, as far as the Levant. [“The Levant” refers to all of the countries on the eastern rim of the Mediterranean.] By Hugh’s death there were Cluniac monasteries throughout France, as well as in England, Spain, Italy, Switzerland, Germany, and what is now Belgium. In total there were some 1,450 monasteries and 10,000 monks. It was an empire that had made Cluny the spiritual heart of Europe, with Hugh himself as its spiritual ruler. His personal authority had been total and unquestioned. One measure of that absolute rule was Hugh’s insistence that all novices had to be admitted to the order at Cluny, and only at Cluny; furthermore every monk, however far away he might reside, was required to visit the motherhouse at least once in his lifetime. This was not simply Hugh’s insistence on keeping an eye on everything – it was his belief that Cluny possessed a spiritual quality that acted as a kind of blessing on all those who could bring themselves to visit the place. The story of Duke William’s far-reaching devise bears striking lessons for Christian people in all ages, including our own. What may we learn from it that we can apply to our own era and to our individual lives? We can learn, first of all, to have greater confidence in God…. In the midst of serious trials, therefore – in our own lives, in society, or even in the Church itself – we can place all our confidence in God’s loving power. All he asks of us is that we trust him and that we try our best to serve him here on earth. He will do the rest. Second, and related to this, is the lesson of holy example, of sanctity’s power in the lives of ordinary people. Duke William’s spiritual progress followed the same line we see in the gospels and in the lives of countless saints: repentance, prayer, generous giving. “Repent” was the initial message of Christ as he began his public life…. A saint knows that every good thing on earth has come from the hand of God, and our task is to return all things to him, for his glory. This is what it means to be “poor in spirit,” as William of Aquitaine saw in the twilight of his life…. 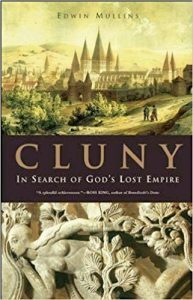 Finally, the story of Cluny can teach us the value of small things given with a generous spirit. When we try to do good for God and others, on purpose, we will always underestimate the good that is done. Neither William nor Saint Berno had any notion what forces for good they were setting in motion through the founding of their tiny monastery. Their ambition was merely to serve God as well as they could here and now, at this time and place. But that was enough. Their small gift, humble in men’s eyes, fit into God’s plans for the salvation of multitudes in the ages to come.